I decided that since the tags were all such vibrant colors I would make the box out of neutrals. That way when you open it there is nothing competing with the colors of the tags. I had a collection of Kaiser Craft papers that I had wanted to use for a while and I thought they would be perfect for this project. 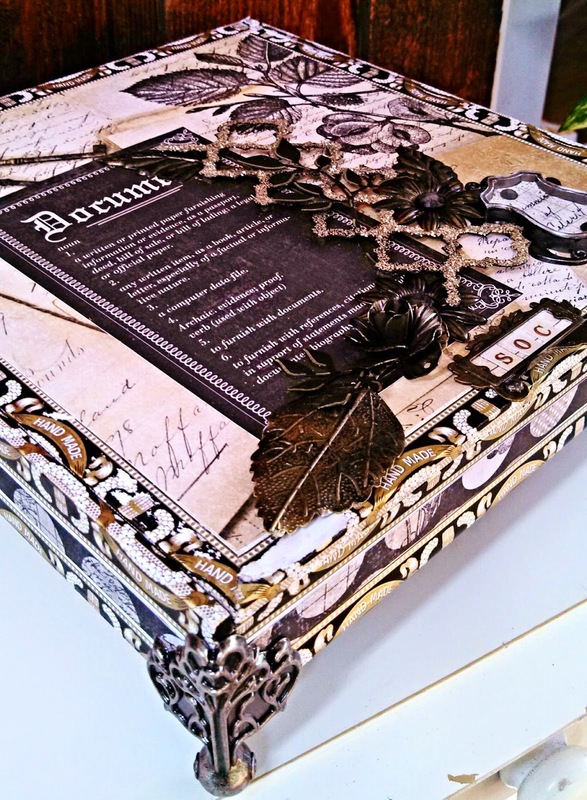 They were all neutrals and I added some black cardstock for the inside of the box. It was a pretty straight forward project. 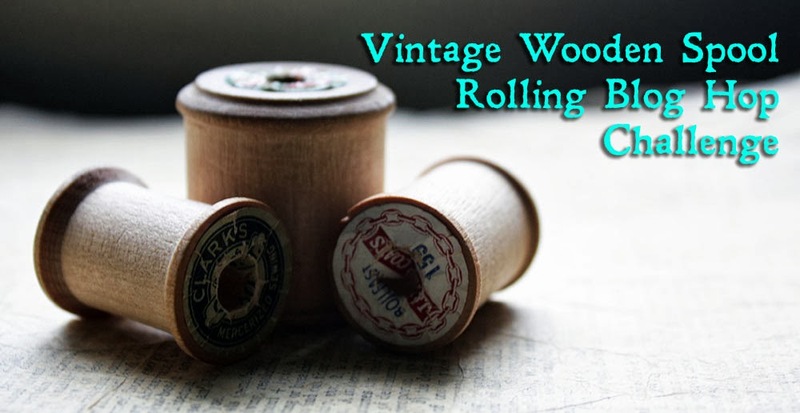 I started with a cigar box that all the tags fit in and covered it with paper and then embellished the top. Here's a detail of the top of the box. I loved this box because the paper on the edges of the box had little banners that said "hand made". So, I made sure to leave those visible. 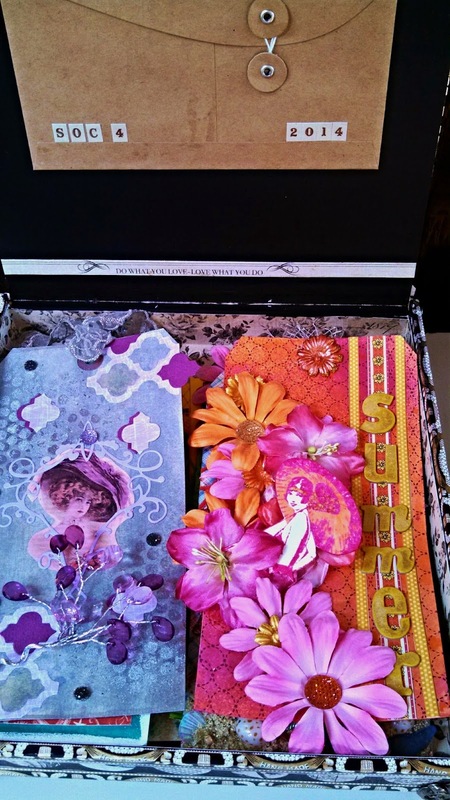 The paper I chose for the top of the box was a collage of ephemera and glasses and keys. I used a cut apart from the collection the defined the word "document", because I figured that was what I was doing, documenting my Summer of Color projects. I then used a technique Paula Cheney used for a tutorial on Tim's blog. 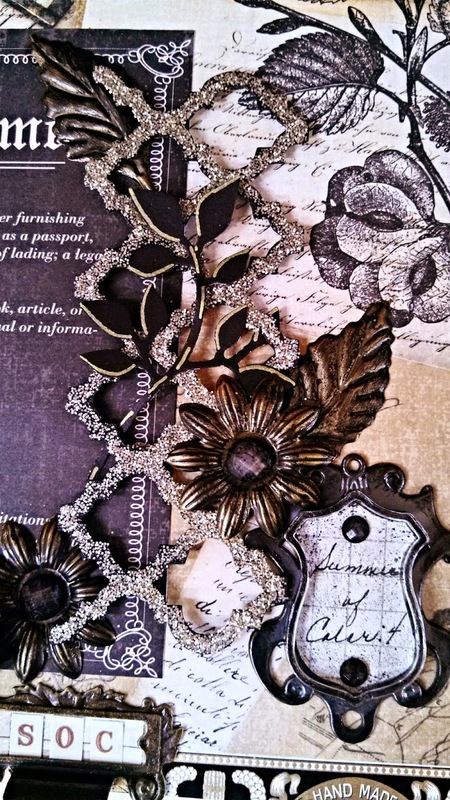 I cut the trellis die with black CS and used sticky embossing powder to adhere Antique Linen Distress Glitter. I popped it up with foam tape. I cut foliage out of black and outlined one side of each leaf with a gold pen. I put that through the trellis and attached the bottom of the stem to the top. I used some leaves and flowers that Linda, from The Funkie Junkie Boutique had gifted me in an order (thank you, Linda). I painted them with Black Soot DP and wiped it off with a paper towel. I then used a Majestic Medallion from Spellbinders with a label inside along with a Graphic45 pull as a handle to open the box. And, that finished the top. I love the pop of color in the black interior. 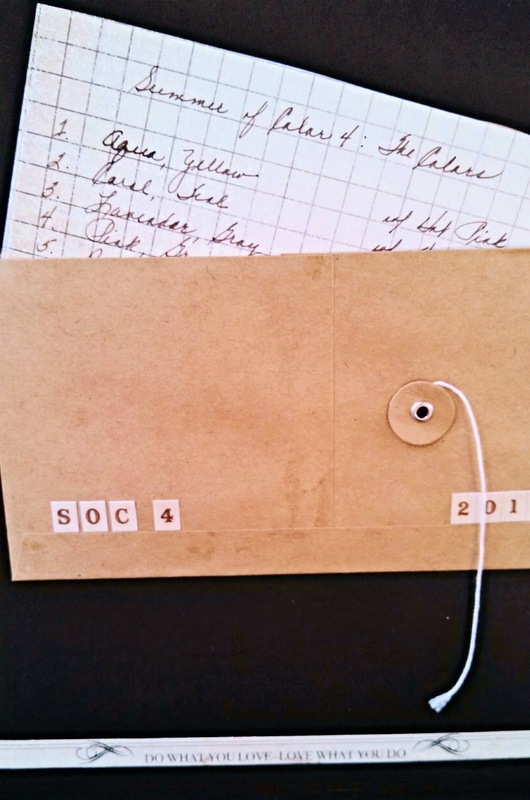 The envelope I attached with the colors for each week listed. The interior is very simple. I wanted to remember the color combinations and so I wrote them on a piece of the paper and put them in a Maya Road envelope attached to the lid. And, since the tags do make me smile with their bright colors, I thought I would document that fact underneath them! So, that's my box which took far longer to make then it was supposed to. I'm really happy with it and I love opening it and seeing all those colors! What fun! Thank you so much for visiting with me today. I really appreciate your visits and your comments. Have a wonderful day and I hope you get to create something you love! 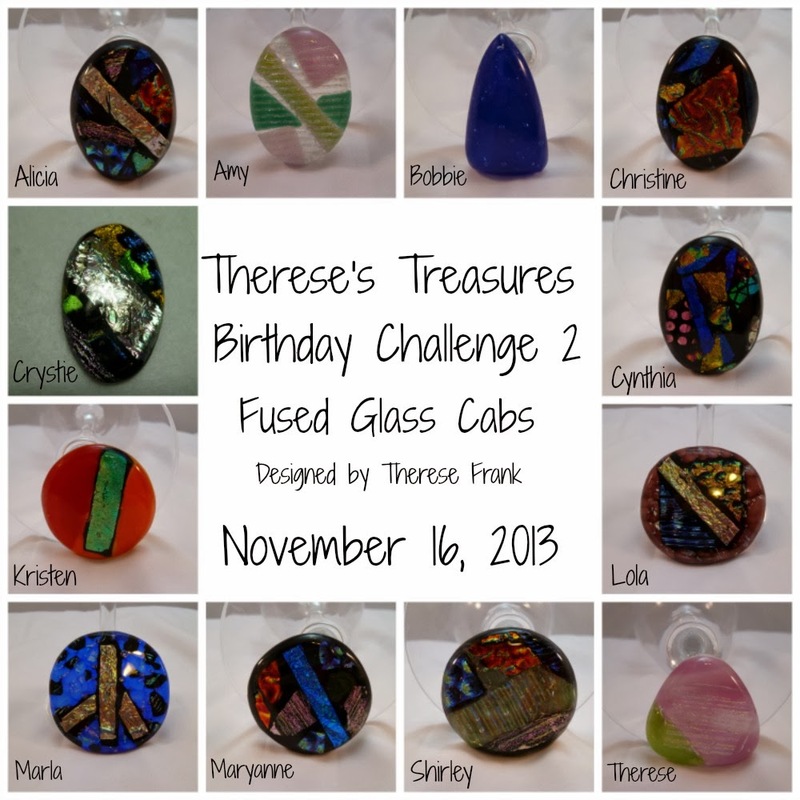 I loved that you made such a treasure to hold your treasures! This is beautiful and should sit front and center on your coffee table! Bravo! thewhat a lovely, lovely box! I've just finished my shadow box (the one I was telling you about) ... so much work!!! 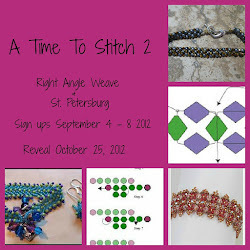 I think I'm going to go back to my beads - ha! it amazes me how much patience you must have to create like this! Oh what a gorgeous box - I love neutrals and this is just stunning, especially with the pop of bright colour when you look inside. 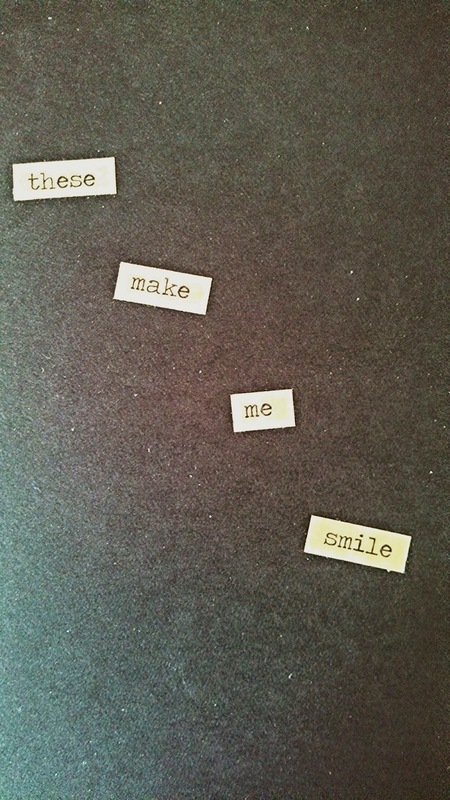 A really lovely way to treasure your beautiful tags. I LOVE this box, Maryanne! It is so beautiful and perfect to keep all of your tags in! 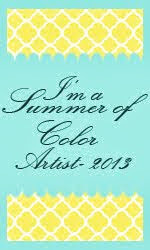 I love that you made this for your summer of colors tags! It is so cool that you put a little envelope to keep track of the colors that we had each week! You are so creative!!!!! Wow !!! 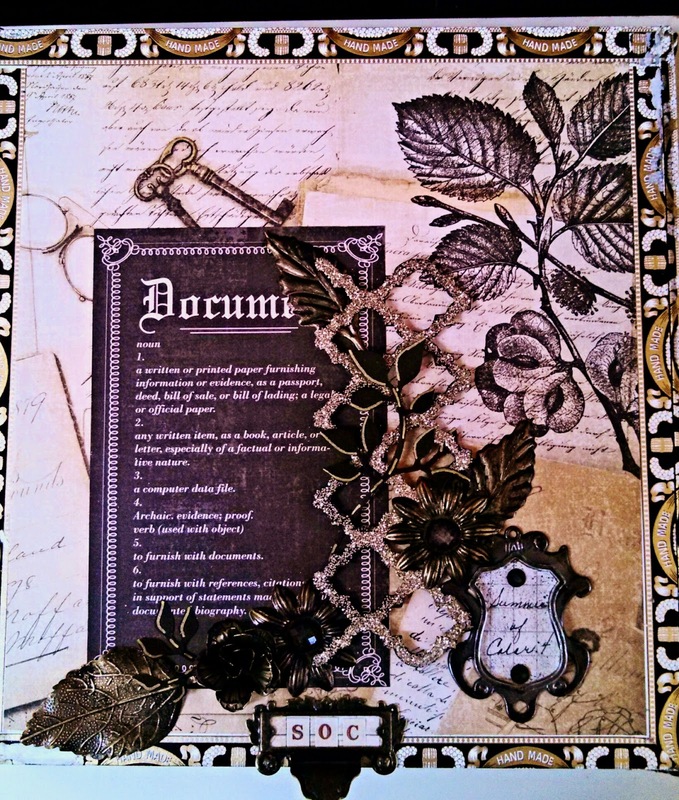 I love this Maryanne :-) Beautiful papers and the decor /embellishments are just stunning. Great technique from Paula and beautifully executed. A stunning storage box to treasure. Hi again Maryanne! Thanks so much for your visit to my blog. It is wonderful to know that you love fall, too!